Using Waze App, Israeli Troops Stray Into Palestinian Camp, Sparking Violence : The Two-Way Two soldiers got lost, entered the refugee camp and were attacked. Other Israeli troops arrived on the scene. A Palestinian man was killed, and several Israelis and Palestinians were wounded. 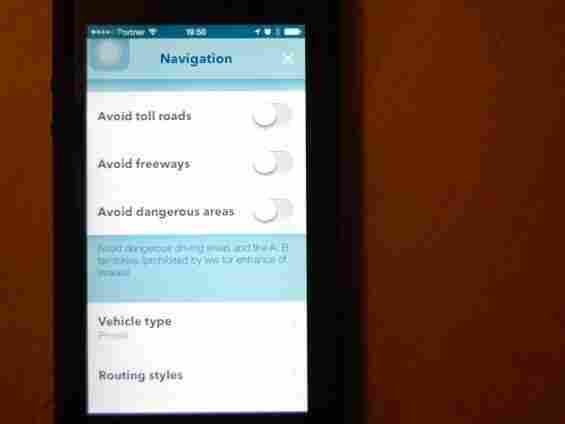 The Waze navigation app has an option to "avoid dangerous areas," meaning areas Israel does not legally allow its citizens to go. This mechanism was disabled on the phones of the Israeli soldiers who strayed into a Palestinian refugee camp. Two Israeli soldiers using a navigation app got lost and mistakenly entered a Palestinian refugee camp in the West Bank on Tuesday, leading to a series of confrontations in which a Palestinian man was killed and four others reportedly were wounded by gunfire. Israel's military said 10 Israeli security forces were wounded during the clashes. The two soldiers apparently lost their way while using the Israeli-developed app called Waze. They strayed into the Qalandia camp, a dense urban neighborhood that was originally set up as a refugee camp 50 years ago. The soldiers were attacked and their vehicle set on fire. The violence escalated when other Israeli forces were sent to rescue them. Israeli Defense Forces spokesman Lt. Col. Peter Lerner told NPR's Emily Harris that the soldiers were on duty and driving to a destination in the West Bank when directions from Waze led them into the Qalandia camp. The area, Lerner said, is "known for its heightened violence when military forces go in there." The Israeli soldiers were "pelted with rocks and firebombs" and fled their vehicle after it caught fire, The Associated Press reported, citing Israeli military spokesman Brig. Gen. Motti Almoz. Lerner said a distress call from one soldier came in just before 11 p.m. local time, and that it took 20 minutes to find him. It took another 40 minutes to rescue the other soldier. The AP reported that one soldier escaped "to a nearby Jewish settlement and the other [took] cover in the yard of a Palestinian family for about an hour before he was rescued by the Israeli troops amid heavy clashes." The rescue mission was over by 4 a.m., Lerner told NPR. The AP added that the "Palestinian Red Crescent identified the killed Palestinian man as university student Eyad Sajadiyeh, saying he was shot in the head during the fighting. The Israeli military said 10 security personnel were wounded." Lerner confirmed that the soldiers who wandered into the camp were using Waze, noting that in Israel the app has a "fail-safe" mechanism to warn Israelis of Palestinian towns where Israel believes it is dangerous for its citizens to travel, such as Qalandia. He said, however, that the military's after-action review found that the fail-safe had been turned off. When asked if it was the standard for soldiers to use Waze for navigation, Lerner said, "We would expect the soldiers not to use it as a default," adding that the soldiers' usage of the app was under review. "The Waze application includes a specific default setting that prevents routes through areas which are marked as dangerous or prohibited for Israelis to drive through. In this case, the setting was disabled. In addition, the driver deviated from the suggested route and as a result, entered the prohibited area. "There were also red signs on the road in question that prohibit access to Palestinian controlled territories. It's the responsibility of every driver to adhere to road and traffic signs and obey local laws- in this incident there were multiple layers of prevention in place. "Waze has and is continuing to work directly with the relevant authorities to decrease such mishaps from occurring, but unfortunately there is no ability to prevent them all together as ultimately some prudence is in the driver's hands." This isn't the first time Waze has come under scrutiny. As NPR reported last year, law enforcement officials urged the app to disable a feature that "allows users to report when they've spotted a police officer, in real time, for all other Waze users to see." Police said it endangers officers' lives.